With the progression of the seasons comes the move from everything pumpkin to everything peppermint. But if the iconic Christmas peppermint candy canes aren’t your thing, you can appease your sweet tooth with your choice of an array of other flavors. Sour Patch, Jolly Ranchers, Orange Crush, and A&W are some, as well as–believe it or not–rotisserie chicken and pickle. Legends about the origins of candy canes link a preacher and his lessons on Christianity to the candy. The story is that candy canes were designed with red to represent Jesus’ blood, white for the Resurrection, and the J-shape for the name, Jesus. None of this is true, but it didn’t stop an elementary school principle in Nebraska from banning candy canes for these reasons. Most likely, the basis of the legend came from someone who indeed did use candy canes to teach about Jesus, but artwork shows images of candy canes long before these stories first circulated. White, straight candy sticks date to the 17th century and came in several flavors, including mint. The twist of red and white began showing up around the turn of the 20th century. And the hook shape may have begun as a means to hang them on decorated Christmas trees, a German custom that became more popular when Queen Victoria and her German husband displayed them in their home in the mid-1800s. What’s your favorite flavor? I’m still a traditionalist and like the peppermint, especially when it’s crushed and mixed with white chocolate. Family cooks have brought about many of our favorite and comfort foods as the result of limited ingredients on hand, rethinking the use of ingredients, and errors in baking. You may know that the original chocolate chip cookie baker intended to make chocolate cookies but the chocolate never melted. The chocolate chip, instead of chocolate, cookie soon topped the list of all-time favorite treats. I recently purchased a mega box of packaged serving size instant oatmeal forgetting how much I dislike it. Instant oatmeal makes a softer textured dish rather than the chewier old-fashioned version which I prefer. So what to do with all this oatmeal? Today I turned some of it into a very quick Blueberry Crisp. I didn’t measure but can give you a general guide to follow. The simple recipe begins by spraying ramekins or a baking pan with non-stick spray. Toss blueberries or sliced peaches or apples (I used frozen organic blueberries), in a sprinkle of sugar. Fill dishes about 3/4 full. Blend a couple of tablespoons of softened butter and/or coconut oil with each package of instant, flavored oatmeal. (I used maple brown sugar.) If using unsweetened oatmeal, you will need to add sugar. You also may want to sprinkle with cinnamon. Bake at 350 until the topping browns. Depending on the amount of butter and sugar added, this is a relatively healthy snack or breakfast that literally takes minutes to prepare. You can bake ahead and have them ready whenever you want. Just top with plain yogurt and serve. I’m not one to long for the past. My life’s been a mix of extremes—excellent and dreadful times. I look back on the good ones with gratitude and prefer not to relive those that were difficult. However, I do miss the Thanksgivings of my childhood. Thanksgiving weekend was relaxing. We laid around through the weekend, savored the leftovers, watched tv, and visited friends and family. We were happy doing nothing! The Christmas chaos didn’t begin for weeks. There’s no down time anymore. We clear the lavish Thanksgiving table without digesting that last piece of pumpkin pie, and are off and running through the New Year. There’s so much to do: shopping, wrapping, card writing, baking, cooking, and partying. Please don’t let this very important holiday pass without a moment of pause. Reflect on our abundance and give thanks. Acknowledge our many blessings and appreciate the food and friendship around us. These are the riches of life. The concept of red velvet cake escapes me. Don’t get me wrong; I’m a fan of the flavors. But what’s wrong with chocolate cake and cream cheese frosting without dying the cake red? Red velvet cake requires 2-4 tablespoons of red food coloring to transform the brown chocolate to red. And do you know what that red food coloring is made from? Bugs. Red food colorants are typically made from chocineal, carmine, or carminic acid, all of which are made from crushed carcasses of a South and Central American insect known as the female dactylopious coccus. It takes about 70,000 insects to make one pound of cochineal. The Aztecs and Mayans produced the red dye for coloring fabrics as far back as the 15th century. It became popularly used in foods in recent times as a safer alternative to those found to be carcinogenic. Today FD&C Red Dye #40 is also used. This dye is not made from insects but rather coal. Red food coloring is used in most red drinks and candies as well as red velvet cakes. Check the labels to know for sure.And enjoy those tasty treats. I’ve been on a cookie diet. 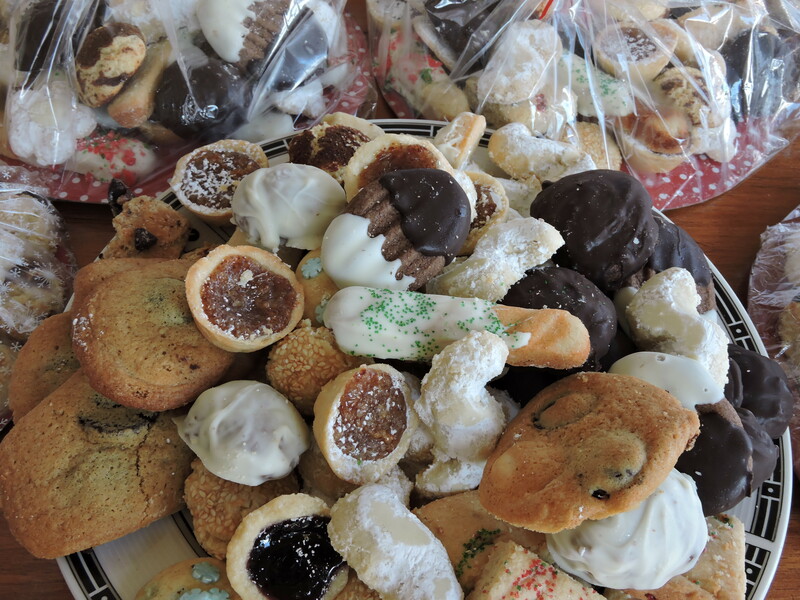 Since the middle of November, I’ve baked and eaten cookies day and night. I use only the finest ingredients—hormone-free butter, unbleached flour, organic eggs, fresh nuts, and—lots of chocolate. Everyone has their favorites. I try to make them all and test frequently to ensure top-quality. The cookie sheets haven’t been put away in weeks. Double-dipped, shortbread, spritz with white chocolate, chocolate covered chocolate, sesame seed, candy cane, almond, pizzelles, and white and semi-sweet chocolate chip. There are many more I have yet to make. There’s a considerable amount time and fine ingredients in these cookies. And all that mixing and lifting of heavy cookie trays takes a lot of energy, so I know I’m burning more calories than taking in. Right? I ask you, can this program be wrong? Here’s Grandma Roses “S” Cookie recipe, a family favorite. It’s a fragile cookie, and a little tricky to make, but melts in your mouth. Mix ingredients. Mold into “S” shapes. Bake at 325 until set(not brown). Remove from oven. Cool. Sprinkle with powdered sugar until fully coated. Did you know that corn is a whole grain? Have you ever tried amaranth? Whole grains are often recommended for a healthy diet, including the one I posted about in regards to lowering the risk of Alzheimer’s disease. But in order to eat the recommended three servings a day, we need to know what qualifies as a whole grain food. Food made from whole grain, whether it is cracked, crushed, rolled, or cooked, contain the entire grain seed in its original proportions. It contains the bran, germ, and endosperm. In the United States, if an ingredient label says whole wheat or whole wheat flour, we can be assured that it contains the whole grain. However, in Canada if the words “whole grain” are not included in the label the wheat may be only 95% whole grain. The most common whole grains include: amaranth, barley, buckwheat, corn, millet, oats, quinoa, rice, rye, sorghum, teff, triticale, wheat, and wild rice. Amaranth, quinoa, and buckwheat do not belong in the Poaceae botanical family as the others do, but are considered “pseudo-grains” because they have the same nutritional profile. Amaranth was a staple of the Aztec culture until Cortez threatened to put to death anyone who grew it in an attempt to destroy the entire civilization. The grain has a peppery taste and high level of protein and an amino acid called lysine that is negligible in other grains. Barley is one of the oldest cultivated grains. Its tough hull is difficult to remove without losing some of the bran but lightly pearled barley is still high in fiber. Buckwheat isn’t really a grain. It’s actually botanically related to rhubarb. Buckwheat grows well on rocky hillsides. Bulgur is the result of wheat kernels that are boiled, dried, cracked, and sorted by size. It is high in nutrition and cooks in only 10 minutes. Corn has the highest level of antioxidants of any grain or vegetable. Most of the corn grown in the U.S. is fed to cattle but also commonly found in foods for human consumption. When corn is combined with beans, the combination of amino acids raises the protein value. Millet includes several small, related grains commonly consumed in India, China, South America, Russia, and the Himalayas. It’s found in variations of white, gray, yellow, and red and is high in protein and antioxidants. Millet is gluten-free and used in flatbreads, side dishes, deserts and even alcoholic beverages. Oats contain a fiber called beta-glucan that is effective in lowering cholesterol and has a unique antioxidant that helps protect blood vessels. The more oats are steamed and flattened, the quicker it cooks. Quinoa, pronounced keen-wah, is botanically related to Swiss chard and beets. It can be found in a light color as well as red, purple, and black. Quinoa should be rinsed before cooking to remove the bitter naturally occurring residue of saponins. It is a complete protein containing all the essential amino acids. Rice can be found in white, brown, black, purple, and red. It’s one of the most easily digested grains and is gluten-free. Converted rice has added B vitamins making it healthier than white but still lacks the nutrients found in brown and other varieties. Rye is high in fiber producing a feeling of fullness. To lower glycemic index, look for whole rye or rye berries on the label. Sorghum, also called milo, thrives where other crops cannot. Although edible and can be eaten like porridge or ground into flour, most of the U.S. crop is fed to animals, made into wallboard, or used for biodegradable packing materials. Teff has twice the iron and three times the calcium of other grains. It is the principal source of nutrition for over two-thirds of Ethiopians. Triticale, pronounced trit-i-KAY-lee, is a hybrid of durum wheat and rye. It is easy to grow organically. Wheat contains large amounts of gluten, a stretchy protein necessary for bread to rise. Bread wheat is considered hard or soft depending on its protein and gluten content. Wheat has many varieties including einkorn, farro/emmer, freekeh, kamut®Khorasan, and spelt. Wild Rice really is a seed of an aquatic grass rather than a rice. It was originally grown by indigenous tribes around the Great Lakes. Because of its high price and strong flavor it’s usually blended with other rices or grains. Wild rice has twice the protein and fiber of brown rice but less iron and calcium. Breakfast is the most important meal of the day, but I have a recipe for you that you’ll want to munch on all day long. I’ve been perfecting my granola recipe for more than six months and have it right where I want it. I think you’ll like it too. Oatmeal is a super food that should be in all of our diets. I don’t mind cooked oatmeal, but can only eat it a couple of times a month at best. Toasted oatmeal is another matter. A sweet, salty, crunchy granola has definitely turned this non-cereal lover into one. The coconut oil and pecans in this recipe makes it healthier yet! Oatmeal contains two types of fiber: soluble which absorbs water and is fermented by bacteria and insoluble which does not absorb water or ferment. Both have health benefits. The fiber in oatmeal helps to decrease LDL cholesterol, (the bad cholesterol), as well as high blood pressure and the risk of mortality from cardiovascular diseases. It helps control blood sugar by slowing down digestion time. Fiber also makes us feel fuller longer, reducing overeating and the bulk cleans us out reducing the risk of colon cancer. Why don’t you give this very quick and easy recipe a try and let me know what you think. Mix the oatmeal, brown sugar, pecans and salt in a bowl. Blend coconut oil, butter, and vanilla. Combine the dry and soft mixtures together. You may want to toss with your hands. Spread the mixture across a cookie sheet. Bake 350 for about 15 minutes. Turn once or twice during baking. Watch carefully. The granola quickly goes from brown to burnt. *Do not use instant oats—which is too soft—or steel cut—which is too gritty. One of the pressing questions of the week is how to make a perfect hard-boiled egg for the family Easter egg coloring marathon. A sure-proof option is not to boil at all. I recently was reminded that eggs can also be baked, as I used to do in the center of my braided Easter breads. The traditional method of preparing eggs for coloring, or simply eating, is to either boil them until cooked or boil them for a few minutes and then allow cooking to continue in the water after removing the pot from the stove top. You can see the recipes in a previous post, (Hard Boiled, March 30, 2012).Unfortunately, we never know if the egg is under or over cooked until we break it open. 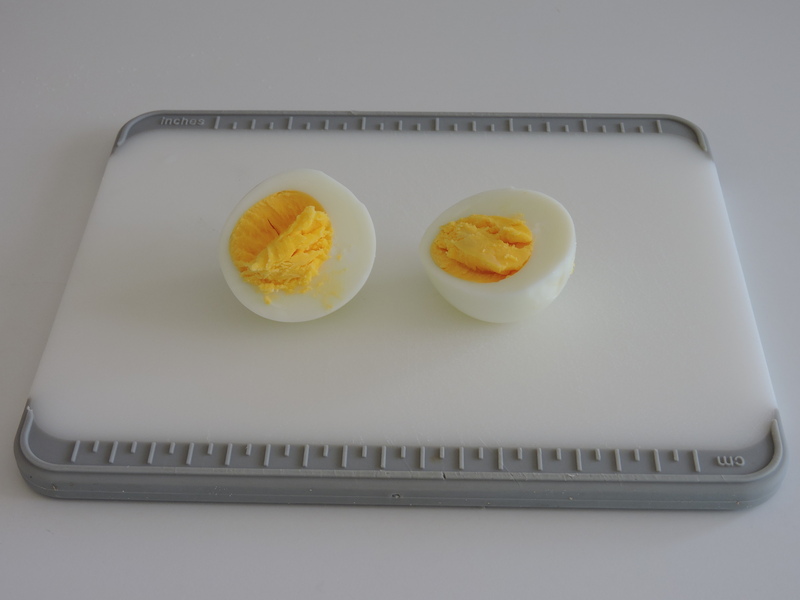 Most often the yolk is too soft or dry and edged in green. 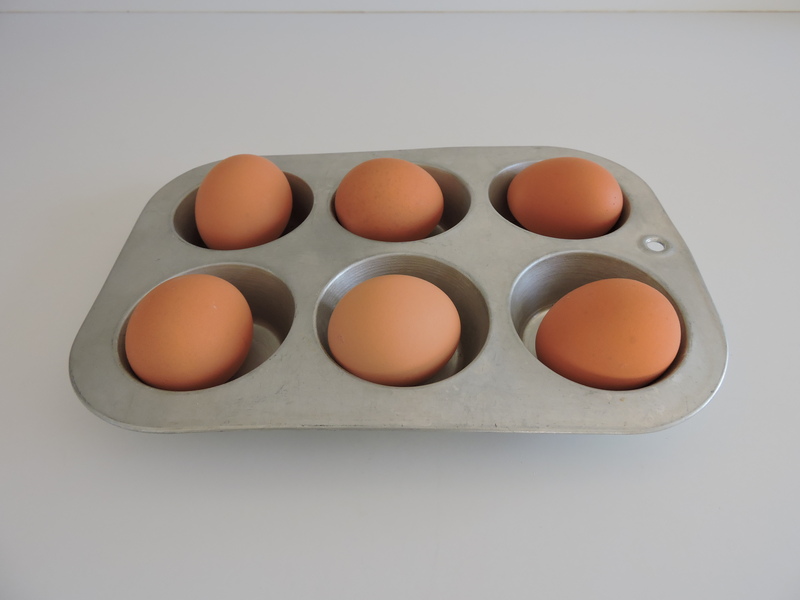 Another option is to place the eggs in a muffin tin and bake at 325 for 30 minutes. I usually buy brown eggs, but you will want white ones if you plan on coloring them. 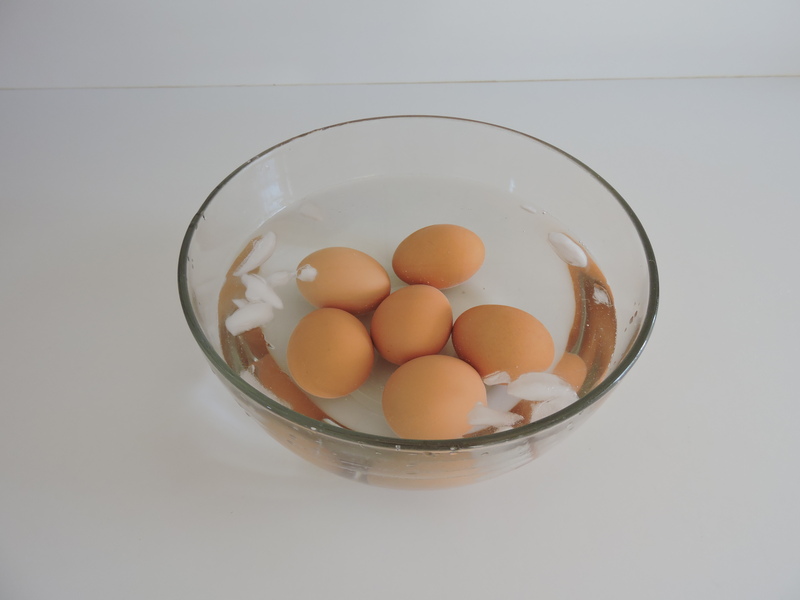 Remove and immediately submerge the eggs in ice water. If your oven is calibrated correctly, the eggs will be perfectly baked. The only draw back is that the egg whites get brown spots on them. Pumpkin biscotti, latte, bread, soup, and even ravioli. This is the season for pumpkin everything. The fruit—yes, botanists consider pumpkins a fruit—play an important role in American fall traditions. Halloween is no more complete without a gutted and carved Jack-O-Lantern than Thanksgiving is without a pumpkin pie. 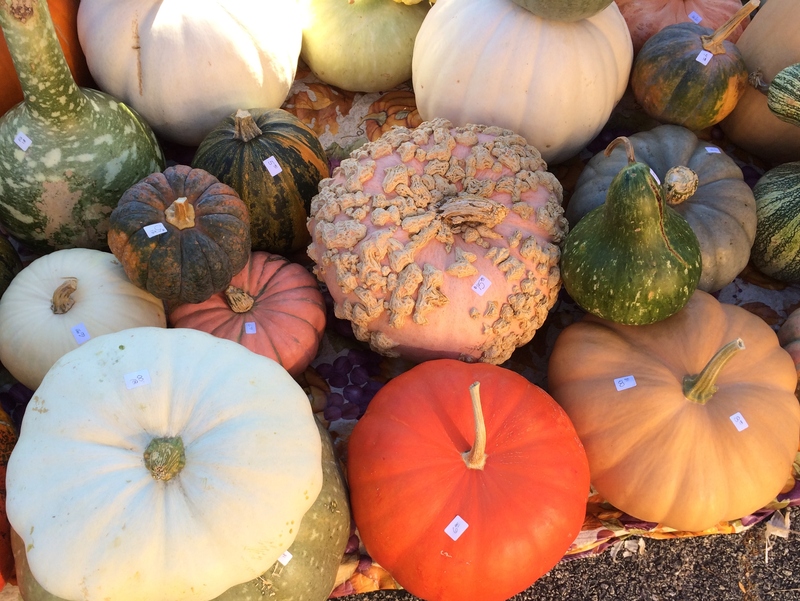 Some countries, such as New Zealand and Australia, use the term pumpkin to refer to the broad category of winter squash but here it typically means the large orange, round or oblong fruit, although we can find them in an endless variety of shapes and colors. It’s estimated that 1.5 billion pounds of pumpkins are produced in the U.S. every year. Illinois is by far the top state for pumpkin production, raising 90-95% of them, mostly for Libby, a division of the Nestle Company. California, Ohio, Pennsylvania, New York, and Michigan grow most of the remainder. 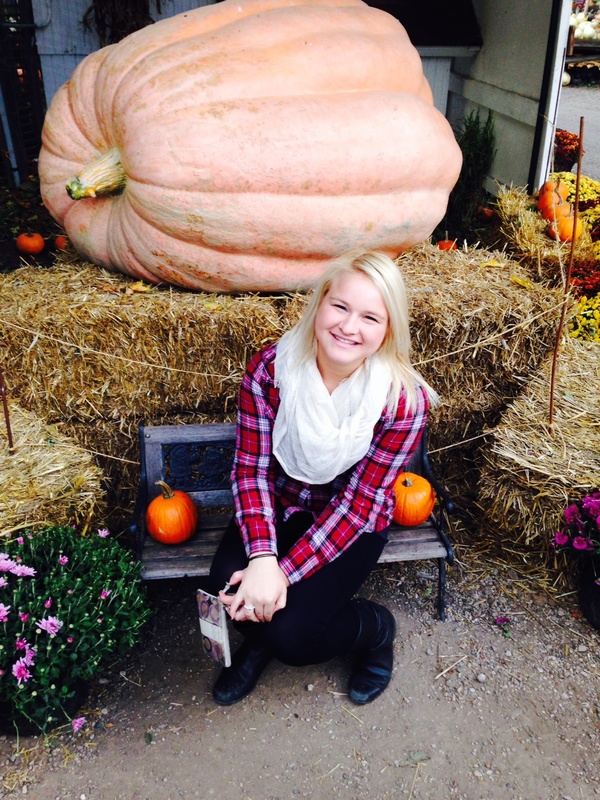 Pumpkins typically range in size from less than one pound all the way up to more than 1,000! They are native to North America. 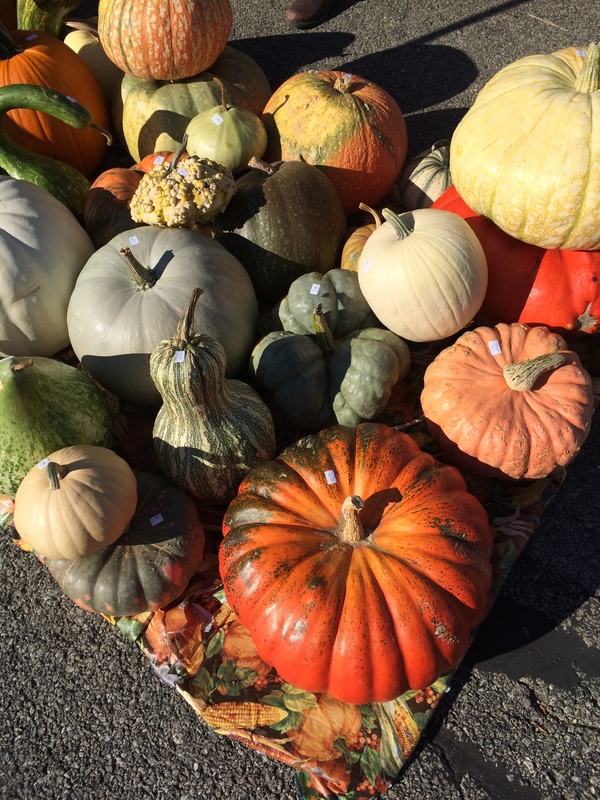 Most pumpkins are grown for eating and can be boiled, baked, steamed, pureed, or roasted. They are a good source of Vitamin A. The seeds are often roasted and salted as well. The tradition of carving pumpkins is thought to have been brought from Great Britain and Ireland where they carved many different types of fruits and vegetables. It wasn’t until the mid-1800s when it is recorded that they were used as lanterns. Catholic children are said to have carved turnips to represent a face, placed a candle inside them, and walked door-to-door begging for soul cakes on the eve of All Saints and All Souls in honor of deceased loved ones. 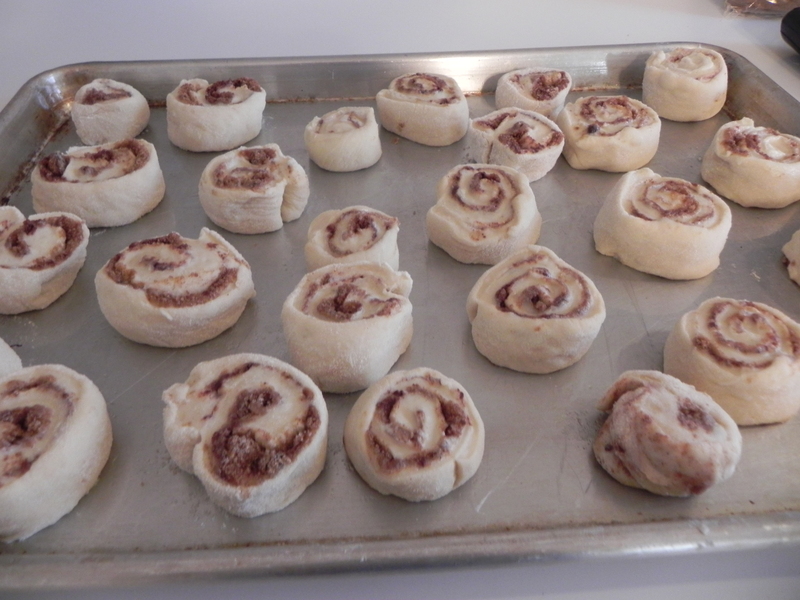 If the aroma of fresh-baked bread lures you to the kitchen, cinnamon rolls in the oven will get you running. I have a recipe that works every time. Some patience is required with all yeast breads. You have to let the dough rise twice, but the extra time and simple steps are well worth it. I mix the dough in a bread maker, but it also can be done in a mixer with bread hooks or by hand. If you don’t use a bread maker, use warm water and allow the yeast to soften in it before adding to the other ingredients. Let me know how your yummy rolls work out. Allow the dough to rise. Divide dough into three pieces. Roll each section into an 8 X 9 inch rectangle. Spread each rectangle with ¼ cup butter. 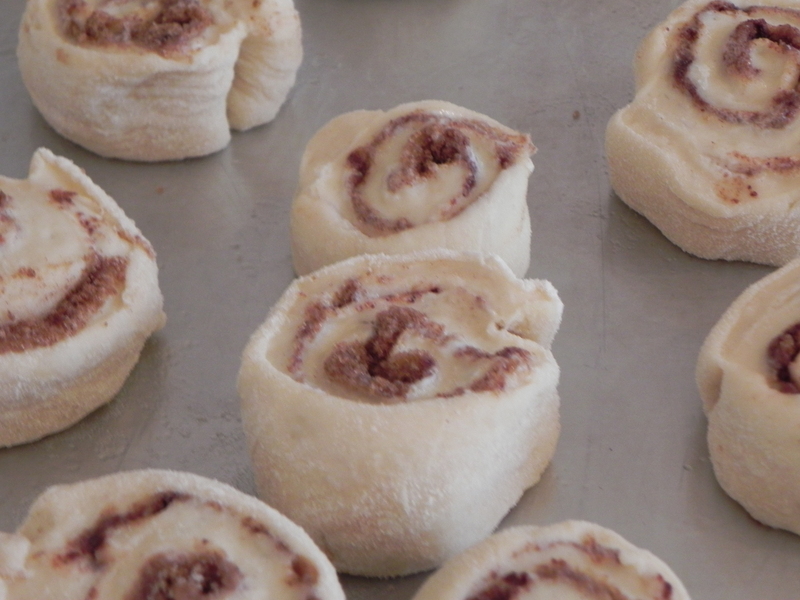 Sprinkle ¼ cup brown sugar, 1 tsp cinnamon, and 1/3 cup raisins if desired, evenly across the dough. Roll up the dough lengthwise keeping it as tight as possible. Pinch to seal. Place on greased baking sheet or baking dish. Allow to rise for about one hour. Bake in a 374°F oven for 10 to 15 minutes. Cool. 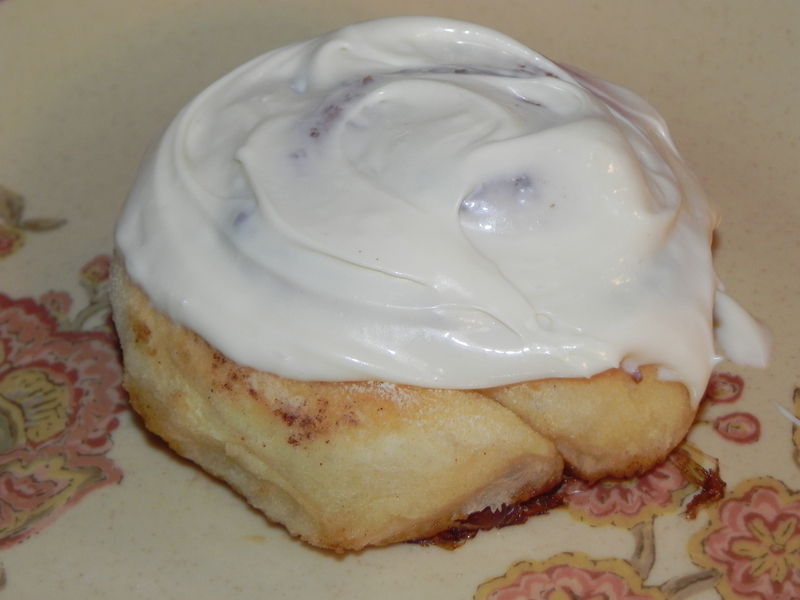 Frost with cream cheese or vanilla frosting. Mix all ingredients together until smooth. If consistency is too thick, add a couple drops more of milk.